A 16-year-old girl was killed by a car shortly after a physical "altercation" at the children's home where she was a resident, an inquest has heard. Emma Cockerill was hit from behind on the B1167 in Thorney, Cambridgeshire, by a driver who did not see her until it was too late, a jury was told. She and a friend had left Thornberry Lodge, where she was a resident, soon after a "physical" incident with staff. The home, which was not a secure facility, closed soon afterwards. Huntingdon Law Courts heard that Emma had been placed at the home in Cambridgeshire by Warwickshire County Council, which was responsible for her care. The court heard she was given a place in Thornberry Lodge, run by Archways Care, which at the time of her death had three other girls with "similar sorts of problems", according to director Chris Aristidou. The home had been set up in March 2015 and Emma was its first resident, the jury was told. The home's first manager had been sacked and it spent six to seven months with another person "stepping up" to the role in an acting capacity, Mr Aristidou said. He said that he had been at the home on 22 January 2016 where he had seen Emma and when he left in the afternoon she had not got dressed. He said after he left "there had been an altercation and [Emma] had gone out" after dark. The court heard she was wearing dark clothing on the unlit national speed limit road outside the property, and Mr Aristidou said residents were advised to wear hi-vis jackets. He said that as it was not a secure unit staff "couldn't physically intervene to stop someone leaving a home" - adding physical intervention would only take place if there was a "significant risk". 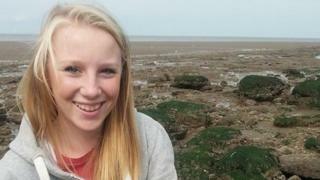 After being hit by the car Emma was transferred to Addenbrooke's Hospital, where she died the following morning. The inquest, expected to last five days, continues.